Days of our Trailers: Stupid Is As Stupid Says: IL Gov. Quinn on Guns. Stupid Is As Stupid Says: IL Gov. Quinn on Guns. There is just to much headdesking stupidity, ignorance, and outright lies in this video for me to even have enough space to bash it all. This is what my dead grandma elected for us. Such sanctimonious paternalism! --I weep for Illinois. I couldn't make it through the entire video. I had to stop after I heard "assault pistols". KofD, you're a better man than I; I didn't make it that far. He surely was working hard to get all the "Warning! Danger Will Robinson! LOADED! HIDDEN! GUNZ! Hi-Capacity Assault Clips!" buzz phrases in. "How DARE a Federal Court come in and tell us what this state has to do!" Dead people are more important than my G*D given Rights. I too stopped the vid after "assault pistols"
July 4th: What Are We Celebrating? 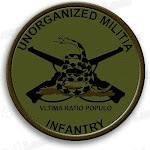 UM Militia Rocker/Tab Patches are GO!!! !